Buying the right training shoes, for your sport, not only protects your feet from strain and pressure caused by movement but can also help you improve your performance. Investing in the right sports footwear will also keep you injury-free. There are many specialist sports shops that sell training shoes for a large variety of different sports. Cross Training and Running shoes can also be found in other retail outlets. If you are serious about your sport however, you will want to ensure you buy the best possible training shoe for your requirements. Buying from a specialist retailer will enable you to find the ideal training shoes that fit your feet perfectly. In order to find the ideal fit you will need to ensure both your feet are properly measured. Measurements should always be taken whilst you are standing. The sales assistant should also look at the shape and arch of your foot. If you have any foot problems, for instance, you may be flat-footed or have high arches, this will also determine the type of training shoe that is ideal for you. Your running style should also be examined on a treadmill. The sales assistant will check to see whether you are overpronating – when your foot rolls inwards – or supinating – when it does the opposite and rolls outwards. How often you run, the intensity of your training, your running surface preferences and other aspects of your fitness regime should also be taken into account. You will be looking for training shoes that fit and function well and are comfortable to wear. You will need to replace your training shoes after every 300-400 miles, so if you are serious about your sport you could be spending a great deal of money on new footwear throughout the year. 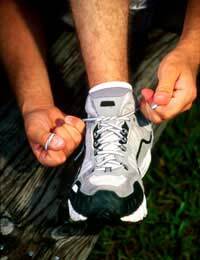 Training shoes should be between 1/2 a size and a full size bigger than your usual shoe size, to ensure sufficient room in the toe box. Feet swell when you run and if there isn’t sufficient space to move your feet your toenails could bruise and blacken, which will cause foot problems. If you wear orthotics or custom-made insoles you should take these with you when shopping for new training shoes, as you will need to ensure the shoes have sufficient room for your insoles to fit in comfortably. Taking your current pair of training shoes will also enable the sales assistant to get more insight into your running style. Whilst the latest trends and colours may be eye-catching it is best to choose a style of running shoe that fits you perfectly, regardless of sportswear branding and popularity. Once you have found a training shoe that fits you perfectly and feels comfortable during performance, it is worth shopping online. Buying in bulk will not only save you money and trips to the shoe shop, but will also guarantee you have a spare pair of your favourite training shoes, should the manufacturer discontinue your shoe style.